How do you make a movie about a 15th Century King of England in 1990s Manhattan? Ask Al Pacino. He made Looking for Richard, a docu-drama adaptation William Shakespeare’s The Tragedy of Richard III. 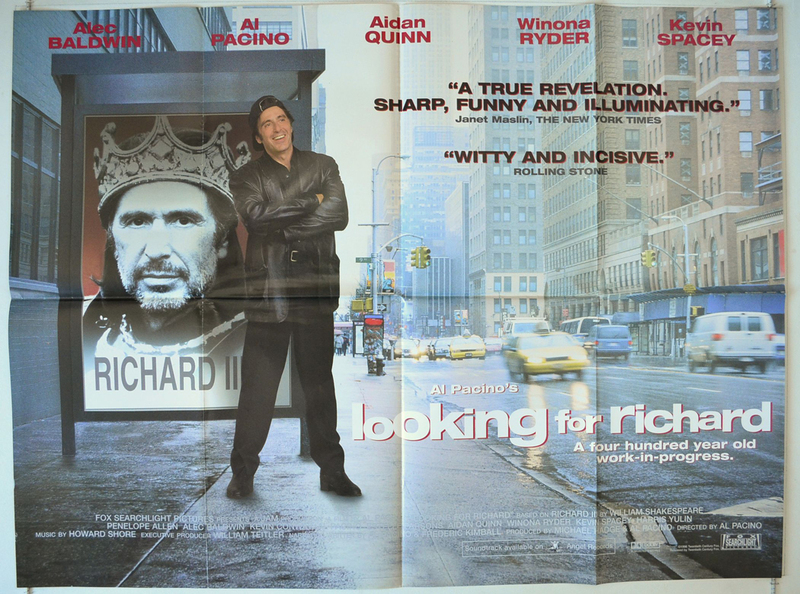 Looking for Richard is Al Pacino’s interpretation of Richard III with Pacino directing and starring in the title role. The film handles the complicated task of interpreting Shakespeare’s play by telling us historical context in which Richard III Gloucester came to power. It covers The War of the Roses, the victory of the Yorks, and the relationships between various royals, and relatives. The film does this so well that the movie serves as a live-action Cliff Notes. Pacino travels to England and visits Stratford-upon-Avon where Shakespeare was born, but the much of the movie was filmed in New York City. He made the film on a small budget and couldn’t possibly fly his cast across an ocean, so he filmed of the scenes from the play in rehearsal, the actors reading the script around a table, or sometimes in full costume on a stage. For a few key scenes, he managed to find a Medieval setting in Manhattan. Imagine that. This is truly resource filmmaking at its best. Pacino filmed his exteriors at The Cloisters, a museum in Manhattan built to resemble a medieval castle, and his interiors at St. John the Divine, one oldest and largest churches in the US. Combined with period costumes and the acting chops of Alec Baldwin, Kevin Spacey, Winona Ryder, and many others, the movie makes us believe we’re in the world of Shakespeare’s play. In addition to showing us the inner workings of the play, we also see Pacino’s struggle in making his film which took four years to complete. We see him attempt to conquer the challenge of performing Shakespeare as an American actor, grappling with the language, and the challenge of filming the film’s climax, The Battle of Bosworth Field on a small budget. This film is an extraordinary achievement considering Pacino essentially made the film in his spare time in between movies. He didn’t have money to buy himself out of trouble, so he employed old fashion movie tricks, creative editing techniques. It’s a lesson to any filmmaker you don’t need a ton of money in order to make an audience understand a 400 year old play about a 500 year old English king. I highly recommend this movie for anyone who is interested in Shakespeare or for filmmakers interested in making a documentary. It’s one of those movies that can be viewed over and over again. Seeing the Pacino’s process as he and his collaborators battle the play, make mistakes, but ultimately convey his love for Shakespeare and Richard III is both inspiring and entertaining. Much like Shakespeare’s plays, Looking for Richard has withstood the test of time. It was released in 1996, and is still just as enjoyable and relatable today as it was 20 years ago. I’m really enjoying this film. Find your blog post while searching for the budget. Any idea how much this film cost to make? Thanks for your inquiry. Glad you found our article. The budget isn’t listed on IMDB, but I know that Pacino paid for the film mostly from his own pocket, so it’s hard to say. Sorry I couldn’t be more helpful. Have you check out our podcast? The episodes are on the blog and our website: BTRP.NYC along with all major podcast channels, YouTube and Facebook. It’s all about Indie filmmaking, so you might enjoy it.